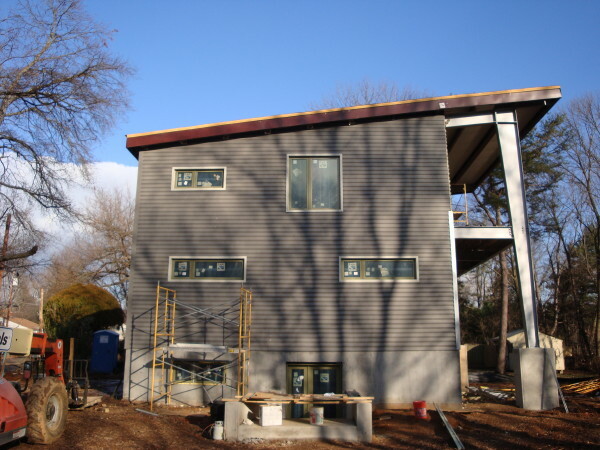 Wall panels on the EcoSteel 3030 House in Cabine John Maryland are all installed, and the windows and panel ends are being trimmed out. Once the outside is buttoned up the owner will being with the interior fit out. There are a couple of additional photos at the Flickr set for the Cabin John house, so jump over there to see them and the entire series of construction photos. Wow, I love it! The tapered steel posts on the back deck add so much to the design. Also, I love the proportion of the concrete vs. the steel. Congrats Greg, this is really nice. Are the house plans for the 3030 house available online? I haven't been able to find them. No - I'm sorry Connie. Right now this is not a house plan design.. only as an EcoSteel product. If you are interested in the house built of something else but steel you should contact me about this to discuss.